A big part of the decoration of your home and the garden is the lighting system as you want the best parts of your home have a nice light upon them, but you don’t want to cry for the next electricity bill either. If you haven’t used by now solar lights, it’s a good thing to at least know few basics features that you need to know about, but some of the downsides too. You may feel like paying a bit more than expected in the beginning and it takes time until you notice the big changes (for the better) on your electricity bills. The solar LED lights are energy and cost efficient as they use the solar light for charging. So, as long as there’s enough sun throughout the day, you shouldn’t have any problems with the lighting of your residence at night. If you’re going to use solar LED lights for your driveway, you should go for the ones that are easy to install and present weather proof as well. The charging battery should be bigger so that the LED lights may charge easily during the day and you need to find a good place, with maximum sun exposure for the battery. There are many options out there when it comes to the solar LED driveway lights and how they fit your needs and budget are the main criteria when making a decision. 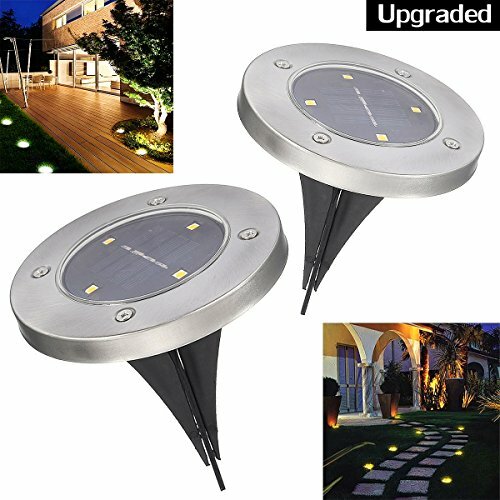 When you want to have good illumination for your driveway, but don’t really want to spend much money for it, take a leap of faith with the Solar Pathway Lights Pathonor Solar Flood Led Landscape Lights Solar Ground Lights. The lights have an in-ground design and build-in black solar panels. The cover is made with silver stainless so the lights take the intense use. The solar panel is quite efficient and a 6-8hours time under the sun may give enough power to the lights for a 10 hours run at night. The IP65 waterproof grade on the lights means they can handle more than just a few splashes. Additionally, the lights are made with long lasting aluminum alloy and ABS plastic, taking the use for a good amount of time. The lights are easy to install and you don’t need to worry about stability once you stuck them into the ground. They stay in place and don’t move away either. We also like the looks of the lights and the silver stainless cover gives them an elegant and classic appearance. Easy to put together and to use as they have an on/off switch button on the back, the lights are a nice, subtle way to light up your driveway. As they’re easy to use, to install and they look pretty, the lights aren’t just reliable but also quite a steal for the price. 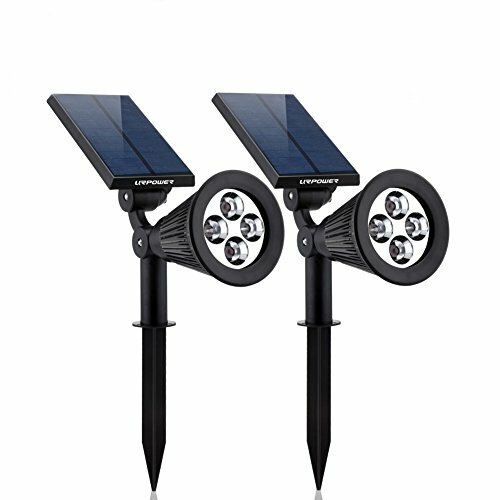 One of the most popular options out there for your driveway is definitely the Solar Lights,URPOWER 2-in-1 Waterproof 4 LED Solar Spotlight. The versatility and the compact shape of the lights are their best assets, but there’s sure more than meets the eye about these lights. You may stick them in the ground and wall mount them, whereas the compact shape makes them subtle and easy to fit in any décor. No matter where you decide to install them, the lights come with the screws you need for mounting. Additionally, the lights have a good build and may also be used indoor and outdoor. The adjustment is easy to do and this is essential in case of all solar lights. The more sun light they get during the day, the stronger the light will be and longer lasting at night. You may easily set the light angle to illuminate the driveway as you want and need. The batteries of the lights sustain their performance as they’re Li-Io batteries that charge efficiently during the day and maintain their charge well, so the lights work all night. Another great thing about the lights is their automatic feature that makes them turn on instantly in the evening and turn off once the morning has come. The lights present also two lighting modes (high or low) and the strong LED bulbs ensure a maximum output of 200Lumens. Each of the lights is independent from the other ones, though. The construction is good and the lights take the challenging weather conditions. The IP64waterproof grade makes them able to work even on a light rainy day. The compact shape means the lights look subtle and nice, wherever you’d place them. Focusing on the bright side and not the inherent negatives, the lights are a good option, especially considering the price you’re paying. Easy to install, the solar powered Solar Lights, URPOWER 20 LED Outdoor Solar Motion Sensor Lights are bright and come with many other good things. 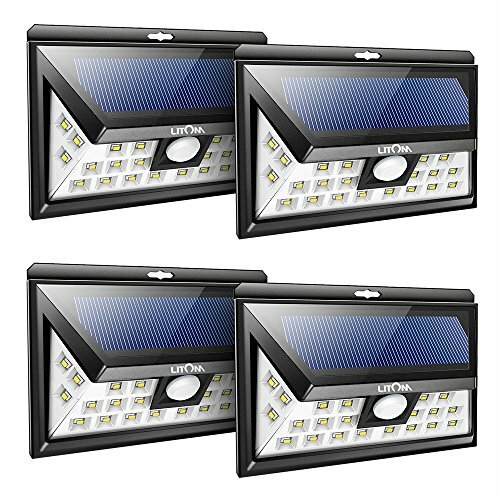 The lights come with a detachable solar panel and LED lamp body to the supporting cover. The stainless steel build gives them durability and ability to take the use for a long time, no matter the weather conditions. The 1000mAh 3.7Li-Io rechargeable battery is strong and gives 10hours of illumination on a full charge. The motion detector is sensitive and ensures bright illumination, increasing your safety. The solar light has two working modes: on/off and the bright light is activated inside the 10 ft. activation zone and a 120-degree sensing angle. Once the instant mode is detected, the lights turn on instantly. As the motion stops, the light remains on for 20 seconds or so. You may go for a wall mounting with the lights but you get everything you need for the installation. The instructions are easy to follow. Waterproof and weather resistant, the lights may be placed 7ft. away from each other and recharge well. All in all, for the good build, motion sensor and reliability, the lights are great for bringing some light over your driveway. 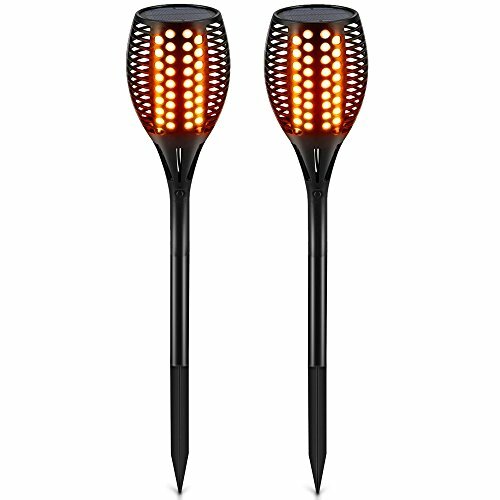 For those of you who are going for an artistic feel in their driveway, a nice and interesting option would be the TomCare Solar Lights, Waterproof Flickering Flames Torches Lights Outdoor. The artistic dancing flame design of the lights is definitely their strength, but the lights bring a lot more to the table. Their size and shape are pretty realistic, so the craftsmanship is also a good thing to mention. Unlike other similar models, these ones have complicated and random dancing effect, which makes their effect even more special. The build is good and the lights are going to handle the challenging weather conditions. They’re waterproof and take the use for quite some time. The lights use build-in Li-Io battery that needs 8 hours of so for charging and for giving light at night for almost 12 hours. As for the wintertime when there’s not much sunlight, don’t worry. The battery still charges and gives around 5 hours of light. The automated-on feature should be also written down on the list of good things so you don’t need to remember when you have to turn them on/off. Easy to put together and to use, the lights give such a nice amber color light in your driveways. Nevertheless, for the nice dance effect, warm colors and overall appearance, you could give these ones a try when in need. If you want some LED lights that make you feel safer at night, don’t hesitate to give it a go with the Litom 24 LED Solar Lights Outdoor, Super Bright Motion Sensor Lights Wide Angle. Bright and effective, each of the lights includes 3 LEDS on both sides, which recommends them as a reliable option for your driveway. The angle is quite wide, up to 270 degrees which may help you feel more secure at night. As they are solar, the lights don’t need any installation whatsoever, but where you’re placing them is far more important. Make note that you may only wall mount the lights so you need to check if that’s the solution for your driveway. They need best exposure to sunlight though as they’re solar. 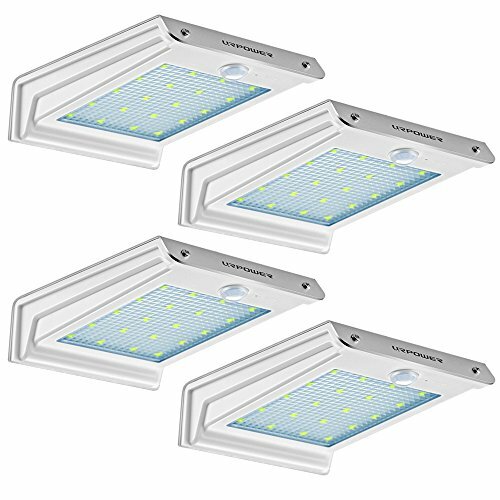 We like not only the ease of installation on the lights, but also their adjustability as you may set three different modes for the lights, just the way you need it at some time. Many think that the reduced light mode is the best choice when lighting up your driveway, but if you’re planning to use them for the front door, go with the full on instead. Use the motion-detected mode for the driveway or the garage area too. The motion sensor is dependable and reactive and its ranging distance is a reliable 26ft. in order to get best results, try to place it at 5.6-6ft. high. Made with ABS material that handles a fall, the lights are well made and have a durability feel. They have a 65IP waterproof grade, easily handling a light rain. 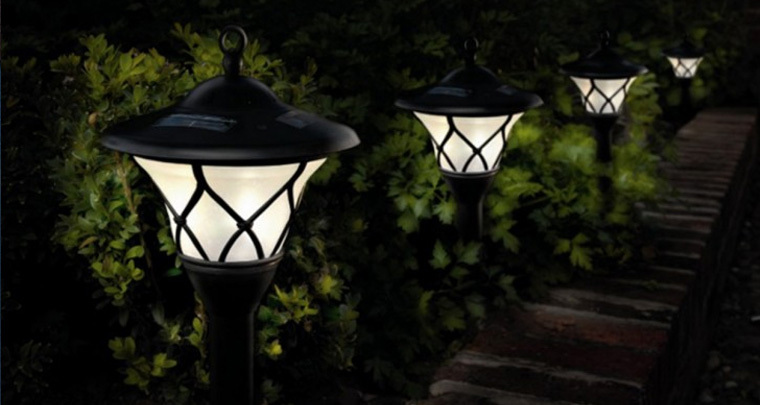 Dependable, adjustable and easy to use, the lights are a good choice for your driveways. Regardless of the downsides, for the good build and adjustability, the lights are a good choice for many.